Junior was interested to see Grandad's horn gramophones. "How many are there?" he asked. "I'll show you two," replied Grandad, "One is older, with a big metal horn. 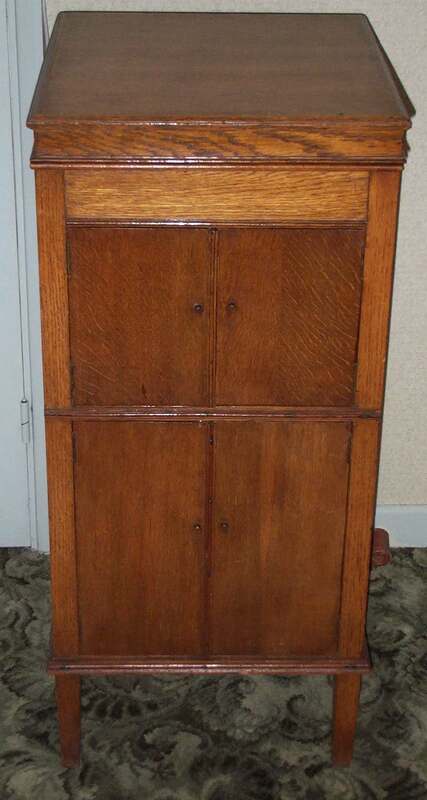 The other is in a cabinet, with the horn hidden away so that it didn't upset Grandma by looking ugly!" He showed Junior the one with the big metal horn. 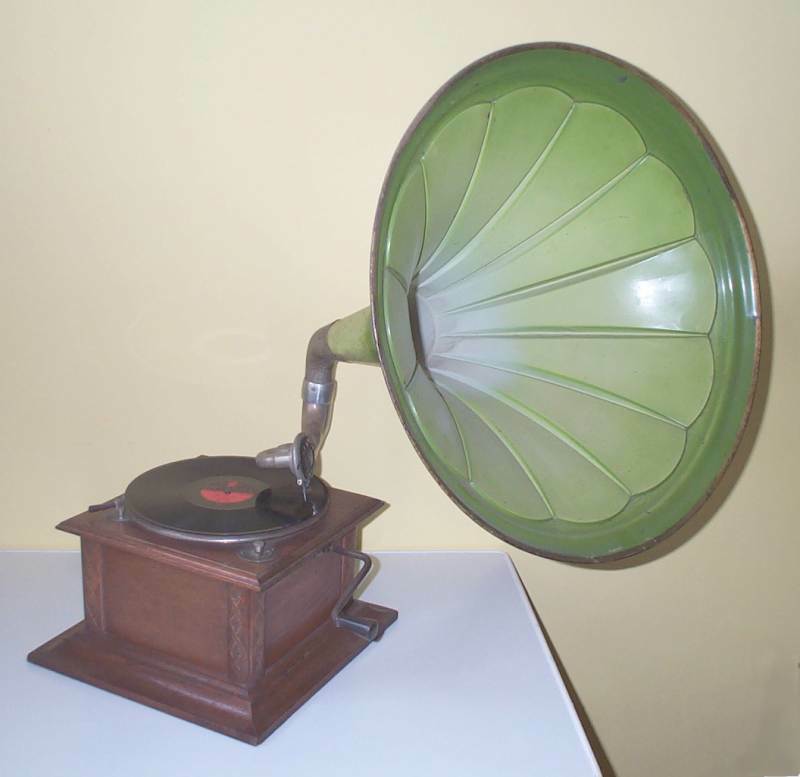 Grandad told Junior that this gramophone had been repaired, and no longer had the original motor. It still played well, though. "You can see how the horn opens out in a cunning way, so that the wider it gets, the quicker it gets wider still." "Well, it's hard for me to exxplain," said Grandad, "But you can see that as you move your view from the pickup towards the opening, the pipe gets wider more suddenly until it just stops being there any more at the wide end." "Yes, I think I understood that," replied Junior. "What are those lines made in the horn?" Grandad replied "The horn has to be quite light or the gramophone would be impossible to move. They used thin steel and pressed those grooves into it in order to make it stronger and less flappy. It already makes quite a 'tinny' sound, but without those grooves pressed into it, it would give a sound all of it's own. If you tapped it, it would clang like a cracked bell." Junior wanted to see the speed control. "It doesn't say 78, but 80," he remarked, fiddling with the little adjustment knob. Grandad explained that most records were recorded at speeds favoured by the recording companies, with no real standard, up until the late 1920's. 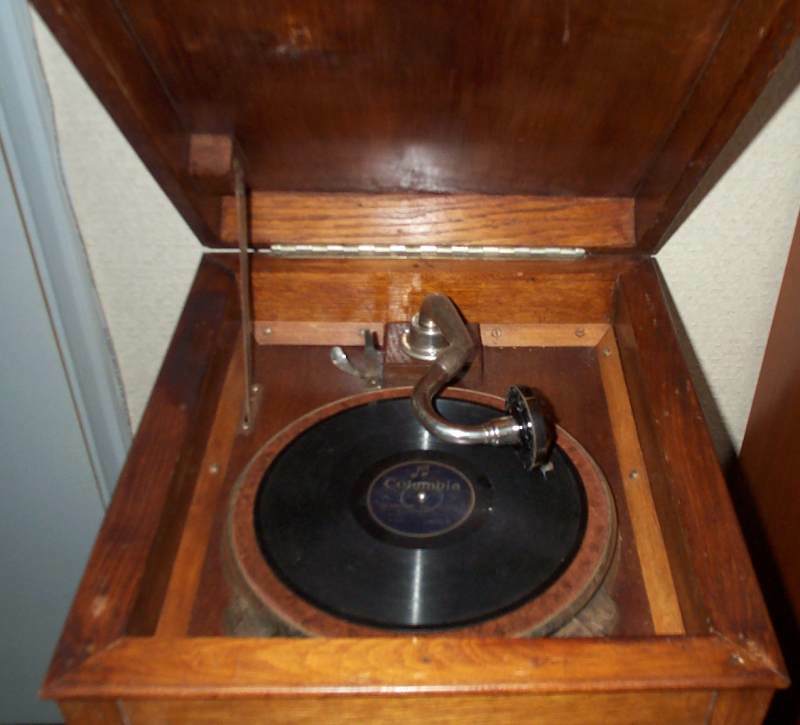 Columbia and others continued using 80 revolutions a minute for some time, and many gramophones showed this speed up until the 1930's, when most manufacturers used 78 r.p.m. "Even then," he said, "Many records were made at other speeds, even if the label said 78! 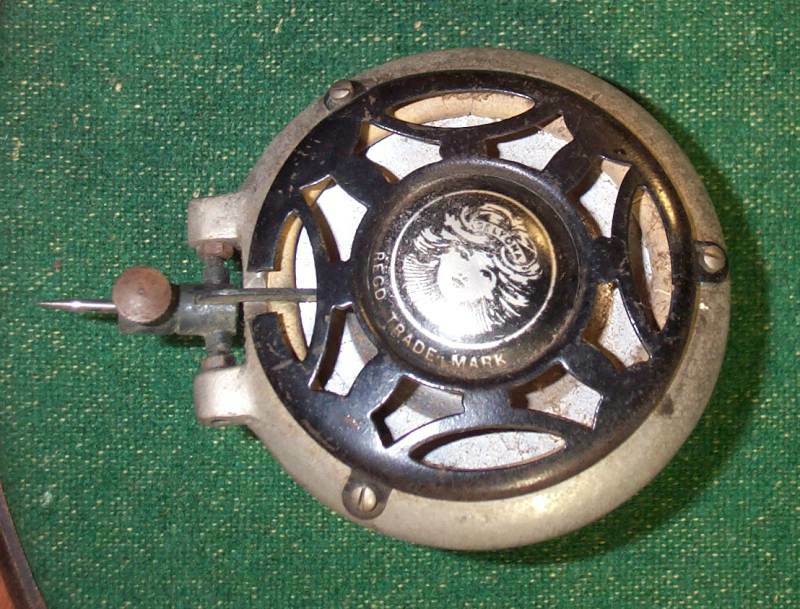 Remember that the speed adjuster on the gramophones was really quite inaccurate, so even if you set it to 80 on the old gramophone it might actually spin at a slightly different speed. It didn't matter, because all that happened was that the pitch of the reproduction changed a bit. "The wonderful thing was that people could hear actual performances of their favourites. They could alter the speed slightly using the control, until it sounded 'right' to them." Junior asked "How is the sound stored on the record? And how is it made back into a sound when it is played?" "Two questions in one!" said Grandad. "Look closely at that record. Can you see, when you look carefully at the grooves, that they wave around slightly? You must look very close to them. I can't see them at all without a magnifying glass - I'll just go and get one." "I don't need one," said Junior, "I can see the waviness of the grooves. Some parts have lots of waviness, and others have closer waves, but wherever I look it looks different to other places." "When the needle is in one of those grooves, and the record is turning, the needle has to follow the waviness. As if moves from side to side, it waggles the diaphragm, that's the round bit inside the pickup that the end of the needle carrier joins to. The diaphragm bends a bit, and tries to move the air next to it. At the front, it is all open, but at the back it moves the air in that pipe bit. That joins to the arm, that's the bit with joints in it to allow the whole pickup to move around the record. At the other end of the arm is the horn, which gradually gets wider until it is wide enough, then it ends. "So the tiny waggling of the needle makes a tiny waggle of the diaphragm. 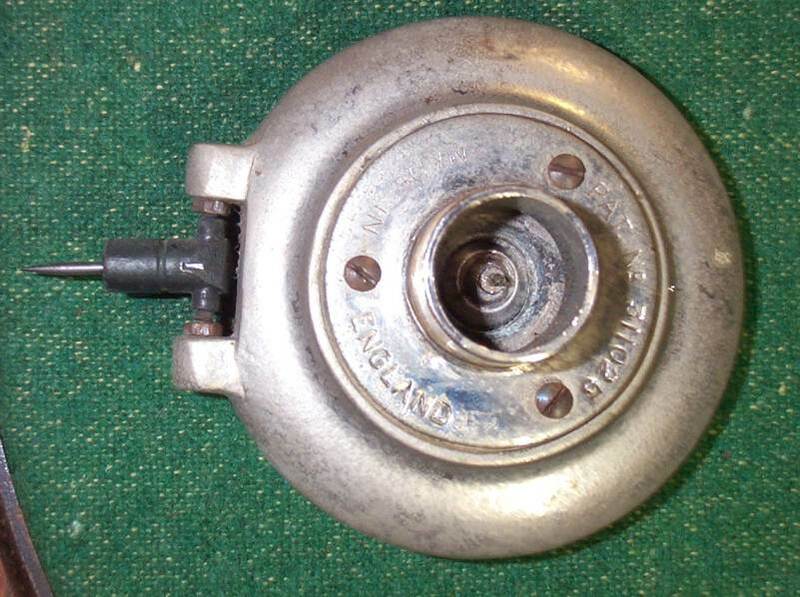 This moves the air in the arm and the horn, until the air in the whole room has the tiny movements. If we are in the room, our eardrums get waggled by the air in the room and our ears give our brains signals that we hear as sounds." "What a pity we can't join the needle straight into our brains, and not worry about all that air moving bit," said Junior, but Grandad didn't agree with him. Grandad put the pickup onto the turntable, so that Junior could see it more clearly. "This pickup is made by Deltona," he said. 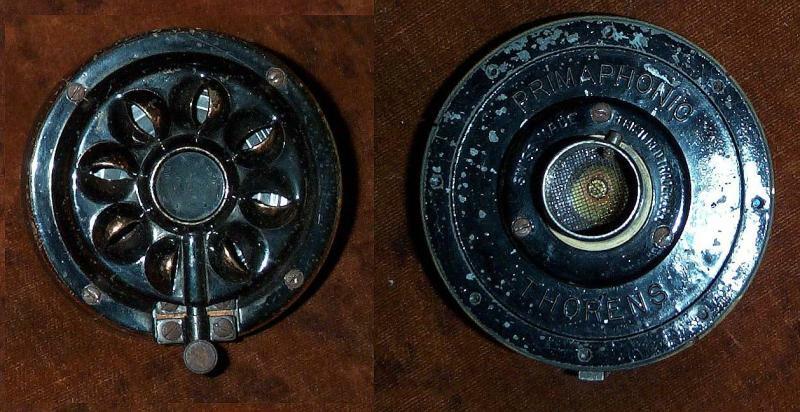 "It has a metal diaphragm, but many people preferred mica or glass. The cream-coloured rubber ring around it, just inside the black front piece, holds the diaphragm in place without holding it too firmly." The back of the pickup. Grandad went into another room, followed by Junior. "Here's the cabinet gramophone," said Grandad. "It looks quite tidy compared with all the works of the horn gramophone, so Grandma, like most ladies, doesn't mind it being here." Junior looked at the closed case. "It doesn't look as much like a gramophone as the other one did," he complained. It just looked like a bit of homemade furniture. "I made it myself," said Grandad. "Would you like to see inside?" "We'll just open the doors, then," said Grandad. "At the bottom is space to store loads of records. I normally have a box of them in there, just to keep them out of the way. It does nothing for the working or sound, but I suppose it does make the turntable high enough to reach!" Junior looked into the top cupboard. "That looks like a horn, Grandad," he said, "But it's made out of wood and the sides are straight, not curvy." "That's right," replied Grandad, "It's jolly hard to make a smooth curve with wood! But the horn works just as well with straight sections like that, and I think that it sounds better because it doesn't add a sort of 'tinny' sound like the metal horn does. 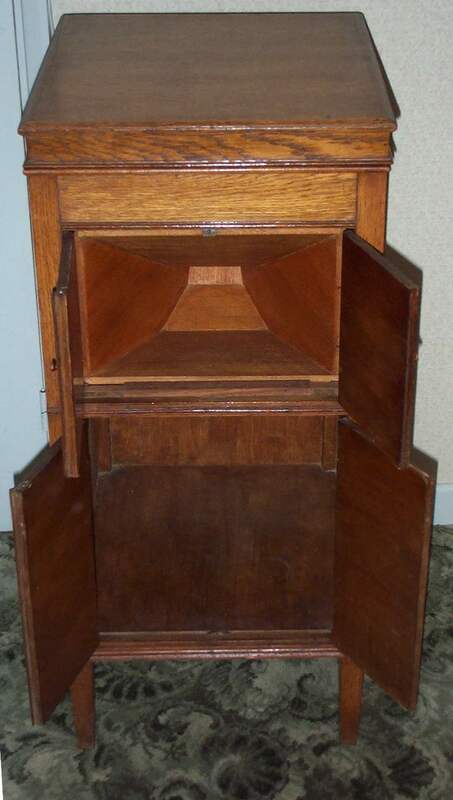 Many home-made gramophones used wood horns like this. Also, if the doors were opened just right, not the way I did, then they act as an extension to the horn and make it work better." "So where's the tuntable?" asked Junior, cutting straight to the point. "Lift the lid, and you'll see," replied Grandad. So Junior lifted the lid. It remained open because of a metal 'stay' on one side. "That one has an odd lever just by the pickup," said Junior. "Hmmm, expensive turntable," replied Grandad. "That's an 'auto-stop' mechanism. 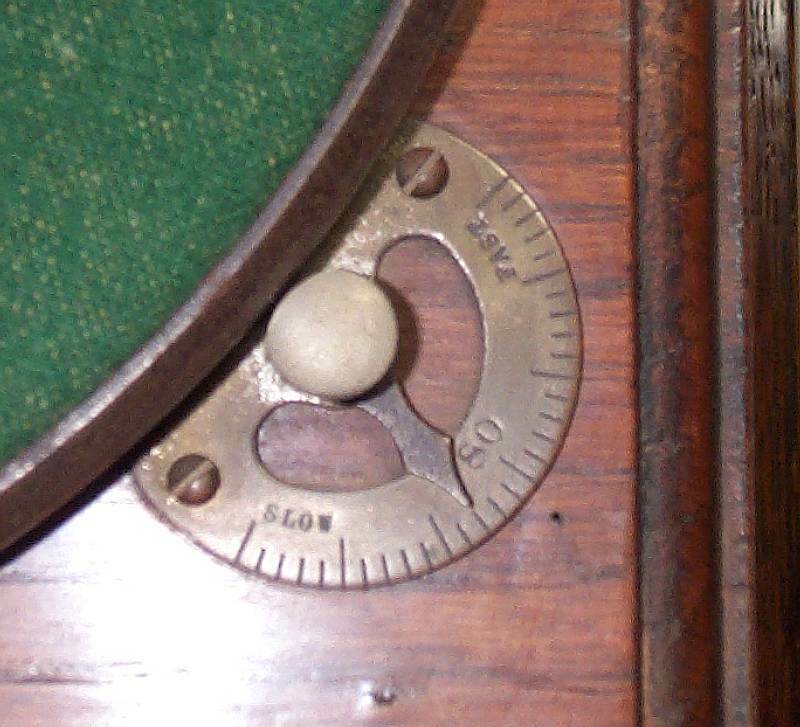 When the pickup reaches the inside end of the record, it operates the mechanism and the brake goes on. It's the old equivalent of what you find on most modern record players. It doesn't make that awful noise at the end of the record for so long, and you don't have to dash over to switch it off." "I can't imagine you dashing anywhere!" said Junior cheekily. "Good job it's got the auto-stop, then," said Grandad, ignoring the bait. "What is the normal speed of this motor?" asked Junior. "This one is marked at 78, not 80 like the other one," said Grandad, "But I don't expect it's very accurate." "Can we see the pickup?" asked Junior. "Is it the same as the other one?" "It looks a bit different, but it works the same way," said Grandad. "This one is made by Thorens, in Switzerland, who still make hi-fi turntables for people who want to play records. This pickup is much better than the other one you saw. Can you see from the front the way that it has sort of folds around the outside of the diaphragm, to make it more flexible at the edges? Ah, that cost me a lot of money!" "I like the shiny other one better than this boring black one," said Junior. "Why does this one have a metal gauze at the back?" "It keeps spiders and flies out," said Grandad. Junior didn't know if he was joking, so he just grunted. Junior asked "Is the gramophone worth a lot now, Grandad?" "No, not a lot," replied Grandad. They wound up the spring and played a record. Junior thought that it sounded much less harsh than the one with the metal horn, so they spent a couple of hours playing lots of Grandad's records until tea time.